What it’s supposed to be: Disney’s answer to Star Wars. Thoughts: I love this movie. It has lots of problems, and to be honest, I love it because of some of the problems it has. It’s moody, it’ creepy, it doesn’t always make sense, it’s ambitious. It’s exactly what you’d get if you took Star Wars and 2001 and mixed in a little light Shakespeare. 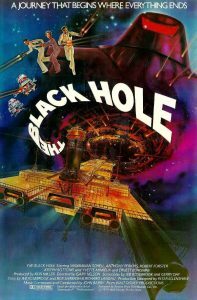 But, with all the talk of Dante’s Inferno as they look at the black hole and with all the creepiness of the mystery of the missing crew and the robot crew and with the ending –oh, that ending! — the idea that it takes place on Christmas adds a different dimension. The darkness of the black hole, the symbolic hell, and the “real” hell everyone finds themselves in (and then out of) are all images of why Christmas happened in the first place. That Christ came to save us from ourselves, our self-made hells, and actual hell. Is It Naughty or Nice? As weak as the Christmas connection may be, it’s there and I’m sticking by it!